70s Casual, Retro Separates Clothing Patterns - MISSES' VEST, SKIRT & PANTS Loose-fitting vest has notched collar, princess seaming with or without inserted purchased faggoting trim, elasticized waistband, and snap or button closing. 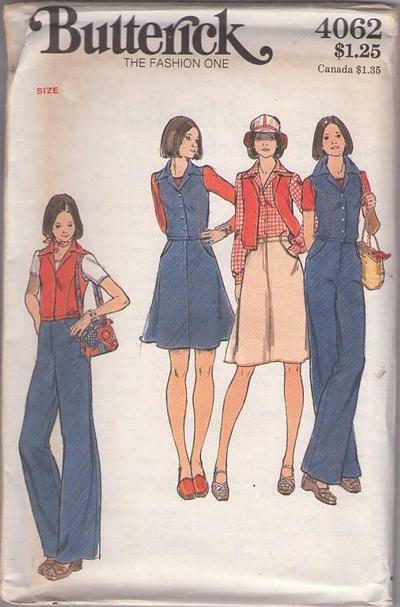 A-line skirt in two lengths and straight-legged pants have shaped back yoke, jean pockets, mock fly closing, optional belt carriers, waistbands with snap or button closing, and topstitch trim. Purchased tops, bag, hat and scarf.